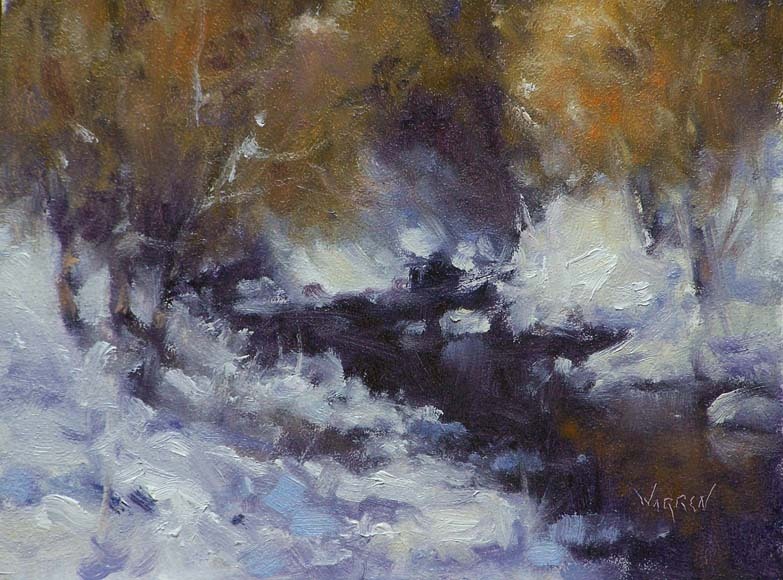 “Bear Creek” will be available on Daily Paintworks starting tomorrow, Dec. 6. This was done in the studio today from a photograph. It was nice and warm in there and I could take my time and work it out. Painting outdoors in the snow works a little bit differently. Feet get cold, fingers stiffen up, paint thickens, noses run, wind (the deal breaker) makes its own hole in you, and shivers take the place of a steadier hand. That’s all just the tip of the ice burg and most of the time it doesn’t matter. 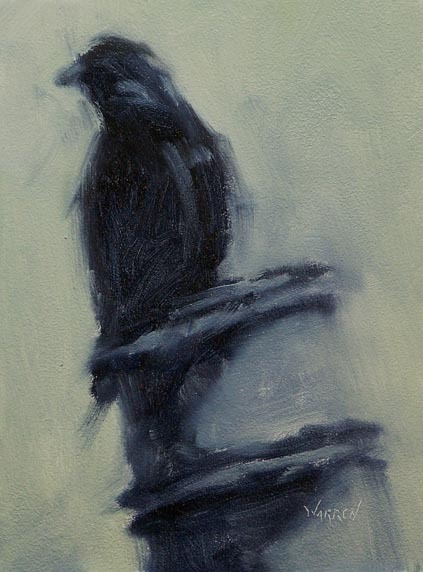 A plein air buddy called today. We’ve scheduled a couple of hours out on Wednesday morning to torture ourselves and do a little painting on Clear Creek. It’ll be the first time out in about a month and for sure the first time this snow season. We’ll get cold, (40 degrees at the high point of the day), and uncomfortable, I’ll complain, he’ll laugh at me, I’ll mutter to myself wondering what the hell I’m doing there but in the end it’ll be worth it. Usually I bring something home that is at least workable either as a piece to rework or, if I’m lucky, to frame. And there’s always that trip to Starbucks after. Or before. Or both.. This last July I met up with a group of plein air painters in Breckenridge, Colorado to paint wild flowers. This was a good year to be there painting as the wild flowers were abundant and of course the company I kept was awesome. This crow gave me time to snap two or three photographs before moving on. I painted this in the studio a few weeks ago. But the reason we were there was the wild flowers. I probably should have painted more of them and not let myself get so distracted by all the cool stuff around me. 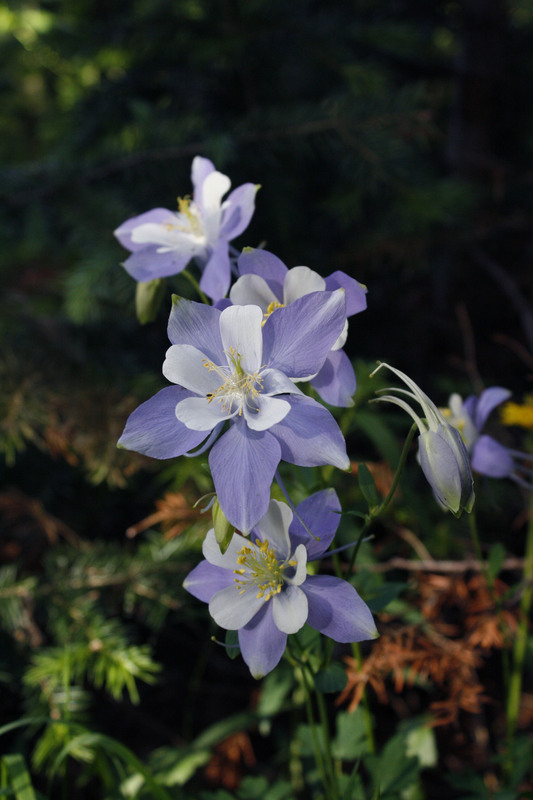 (I’m easy that way) I took a heck of a bunch of photos though and this picture of the Columbine is one of my favorites. It was late afternoon and conditions were perfect but changing pretty quickly. This photo was as good as I was going to get.